Here at ExtremeSportsX.com we are incredibly excited about the forthcoming World Extreme Games 2014, sponsored once again by Kia Motors. There’s no doubt that anticipation is building throughout the world of extreme sports, and with the action taking place in just over a month’s time, we think it’s high time we take a look at what’s going to be happening over in China at the end of April. First of all, we can look forward to four days of action packed events, with the cream of the crop of extreme sports stars descending on Shanghai. The action kicks off on the 30th April and runs through to its culmination on the 3rd May, with a whole host of categories and disciplines on offer. Aggressive In-Line in both Street and Vert format will return again this year, and we can also look forward to Street, Vert and Mini-MegaRamp disciplines in the skateboarding category. BMX Freestyle will run with the same disciplines as the skateboard comps, and to round things off, there will be separate male and female speed climbing events as well as a Big Air competition for Freestyle Motocross. The Biggest Extreme Games Ever? This year will be one of the biggest ever extreme games festivals in more ways than one. Worldwide exposure is huge this time around, with TV network Fox Sports capturing all of the action live across Asia, with Fox Sports also broadcasting to the USA, Latin America, Australia, Europe, the Middle East and Africa. There’s no doubt that viewing figures around the world are going to be through the roof for an event of this size, and as we’ve seen before, events of this nature held in China are normally off the chart as a visual spectacle! On top of this, around 200 extreme sports stars from all over the world will be participating in the event, making it an absolute must see for any extreme sports enthusiast! With around $250,000 up for grabs across the games, the competition is going to be fierce, and we believe it’s going to be one of the very best World Extreme Games yet! Amazingly Affordable Tickets to the Event! It’s great news to be able to catch all of these great events on TV all over the world, but of course, it’s going to be even better being there in person. Thankfully, tickets are very affordable considering the number of extreme sports superstars likely to be performing during the games. Tickets can be purchased online from htp://www.gewara.com or from the Hotline -4000-406-506 for just RMB 80 per day for an adult early bird ticket, or an even better RMB 60 per day for students. On the day ticket prices are a more expensive affair, with RMB 220 a day our quoted figure. We highly recommend purchasing early, both to take advantage of the fantastic online prices, and also to ensure you don’t miss out. With the games only weeks away, tickets are sure to sell out fast. These games are likely to be one of the most exciting yet, and with the world looking on, top extreme sports superstars should be at the top of their game. We can’t wait to see how it all pans out, so keep coming back to us to find out more information as we lead up to the first day of the Kia World Extreme Games of 2014! This entry was posted in BMX, Featured, Land Sports, Motocross, News, Skateboarding and tagged 2014. 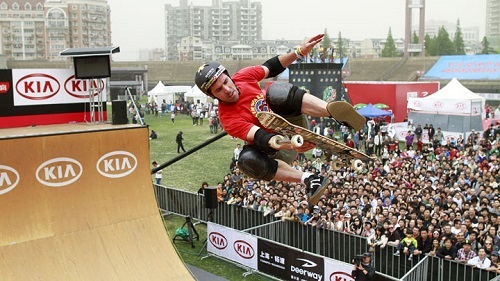 Extreme Games, Extreme Sports, Kia World Extreme Games, Shanghai. Bookmark the permalink.